Google executives defended the company's recent U.K. tax settlement before a hostile parliamentary committee on Thursday. Last month, Google announced that it had agreed what some have described as a "sweetheart" deal with Her Majesty's Revenue and Customs [HMRC], the U.K.'s tax authority, following an audit of its tax affairs dating back to 2005. The deal went down badly with Britons in the process of filing their taxes, and prompted Meg Hillier, chairwoman of Parliament's Public Accounts Committee, to summon Google and HMRC to London to explain the deal to members of Parliament. Despite having called the company representatives to present evidence on Thursday, committee members seemed on occasion unwilling to hear them out. Matt Brittin, Google's president for Europe, Middle East and Africa, was interrupted before he could begin an explanation of how the U.K. subsidiary functioned. "Mr. Brittin, I know the way you operate," Hillier said. Attempting to raise doubts about Hillier's knowledge of the company, he only got as far as, "I'm not sure," before she interrupted him again. On other points, though, it was Brittin who was reluctant to answer. Britons in the process of calculating their tax liabilities for the last year were angry that Google had paid so little, Hillier remarked. "I fully understand the anger," Brittin said. Hillier retorted: "Do you really understand the anger? What do you get paid, Mr. Brittin?" Brittin ducked the latter question repeatedly, offering to disclose the information to the committee privately if it was relevant to its inquiry then, when pressed, saying, "I don't have the exact figure." Hillier responded incredulously: "You don't know what you get paid, Mr. Brittin? Perhaps you could give us a ballpark figure. Forget the share options, what's your basic salary?" Brittin still declined to answer. The reason that Google's tax deal went down so badly with the British public and parliamentarians was that the U.K. subsidiary only reported £642.4 million (US$920 million) in revenue in to U.K. tax authorities in its 2013 fiscal year, despite its U.S. parent saying it made 10 percent, or $5.6 billion, of its global revenue in the U.K. that year. Despite that, U.K. profits generate a small fraction of the overall tax bill, Hillier said. In 2013 the U.K. subsidiary had set aside £21.6 million for tax on net profit of £49.2 million. The commitee previously suggested that the proportion of Google’s global tax paid in the U.K. ought to be closer to the proportion of its global sales made there, rather than the much smaller sum it reported as its U.K. economic activity. "If those were the rules, that's what we would do, but the rules are, you pay tax on the profit on your economic activity," he said. Google's settlement with HMRC reflected that principle, he said. "It was the conclusion of a rigorous 10-year tax audit in which we are paying tax at 20 percent like every other U.K. company." 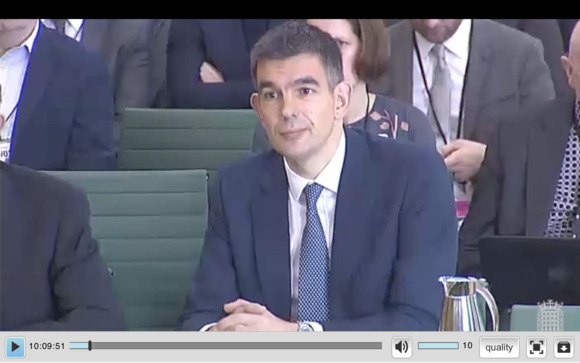 Brittin's attempts to pass complicated financial questions to the parent company's global head of taxation, Vice President of Finance Tom Hutchinson, were brushed aside by committee member Stewart Jackson. "I'll decide who I ask the questions, thank you very much," Jackson snapped. Hutchinson was allowed to explain that the sum Google agreed to pay HMRC was not a negotiated settlement. "That's not the way the process works," he said. The £130 million was derived directly from application of the tax rules, he said, with £18 million of the sum due to interest. None of that sum, though, was paid as a result of a new diverted profits tax widely known as the "Google tax" because it was intended to catch multinational companies using transfer pricing and other techniques to report revenue in the most fiscally favorable jurisdiction. Google was unaffected, said Hutchinson, because the new tax was in effect for only three months of the 10-year period covered by the settlement. Brittin and Hutchinson spent much of their time trying to explain to committee members that Google recorded its revenue and profit in the country where value was created, and that the vast majority of Google's engineers building the system creating value are in the U.S. Asked why HMRC's audit took six years -- "longer than the Second World War," one committee member remarked -- Brittin explained: "We did provide them with an awful lot of information." That information included contracts, interviews with staff, and details of how the company's products operate. HMRC "listened to customers calling us so they could understand the facts of our operation. We were fully transparent with them," Brittin said.